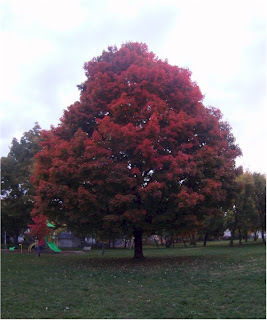 RANTWICK - Commuter Cycling in London Ontario | A Bike Blog: I'm Seeing Red. If I can catch him in the right light, I think he's got a good chance of "winning"; although I won't allow myself to win the contest. If he garners the most votes, the runner-up will win the awesome second-hand Rantwick-modified Trophy of Arboreal Distinction naming the tree King Of Autumn, 2012. I have also just decided to throw in a tub of breadcrumbs. What robes will the new King (or Queen) wear as he (or she) ascends the throne? Only time will tell. 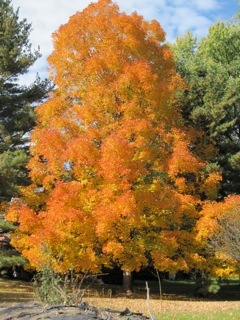 Having seen these images, I'll bet you know of a tree that could be a contender. Don't wait! Get out there and get that picture! 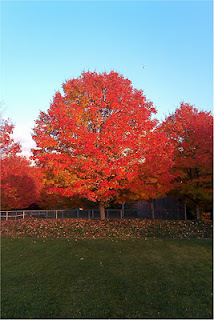 Hover around that tree, day after day, hoping to get the best damn foliage picture EVER! Or, snap a pic of it on your way by with a crappy old phone while riding your bike over bumps. I don't care! I want submissions, (click here for rules) and I'm getting nervous. I want to beat last year's record of 18 real bad. This year, my best chance at a tree will come next week. Good luck with The King, Rantwick. Leaves are changing rapidly here, but my contender had barely yellowed as of Monday. With luck I'll get to look again next Monday, if I don't have to go to work. Ah, how fitting that my most long standing online weirdo acquaintances leave reassuring comments... thanks both. I got email from Recumbent Conspiracy Theorist too. I'm feeling very optimistic about this year's crop. Me and my less than $100 point and shoot have snapped a couple photos this week...in nearby Bayfield WI. The Bayfield WI, home of none other than the world famous Bayfield Apple Festival. Smack! Need I say more. Probably not.